We bridge the business enterprise, law enforcement and national security methodologies into one cohesive approach. 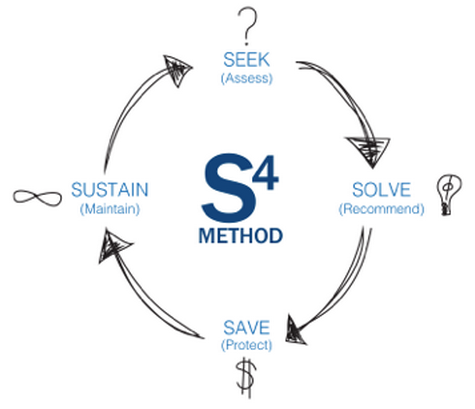 Our S4 Method (Seek. Solve. Save. Sustain.™) creates a structure that our experts operate within to achieve the best client results. A large part of Investigative Consulting is preparing a company’s security team for how to handle unique situations. Through training and culture “tweaks,” Preting sets security teams up with the tools and resources they need to handle challenging security situations. We dive into your company culture, sift through your current systems and map out existing processes, resources and connections. This approach can cover anything from a specific project to an office division or the entire company. The word “solve” indicates a problem; however, we choose to look at it as the opportunity to improve systems with both proactive and reactive solutions. This is the phase where we get creative with options to create and/or refine a company’s goals. The fun part. We help you execute a plan that saves you time, money and lives. Key parts to any solution are continuous implementation and consistent follow through. Preting works hard to integrate solutions into existing systems that do not create more work for the company, but rather make the current work more efficient and secure.